FullContact's My Contacts are those contacts that you have designated to sync with FullContact on your Sync Sources/Settings page (or have chosen to explicitly add to My Contacts). These address books (Google Contacts, iCloud, and/or Exchange) are the connected sources that sync with your My Contacts (if you've turned syncing on). If you've connected your Twitter or Foursquare, My Contacts will be automatically updated by contacts from connected social network sources. For example, if you have a contact in your My Contacts (let's call him John Smith) and John also follows you on Twitter, his Twitter handle will be synced/added to his contact in your My Contacts. So, instead of having two John Smith contacts (one with John's email and one with John's Twitter handle), you have one John Smith contact with both an email address and a Twitter handle. Lastly, My Contacts is the specified address book in your account that we will search for updates and duplicates. How do I create a new contact in My Contacts? In FullContact for Web, click the [+] icon, then click Contact. In FullContact for Mac, click on the plus sign next to the search field, and after the details are filled in - press Done. In FullContact for iOS, click the [+] icon in the upper-right-hand corner. In FullContact for Android, click the [+person] icon in the lower-right-hand corner. In FullContact for Web, click [...] in the upper-right hand corner, then click Delete. Otherwise, you can also select the contact using the check-box, then press Delete. In FullContact for Mac, click on a contact, then click the trash icon in the upper-right hand corner. In FullContact for iOS, click on a contact, then click on the vertical three dots [...] in the upper right corner - then press Delete contact. Otherwise, you can also press on the pencil icon and then press Delete. 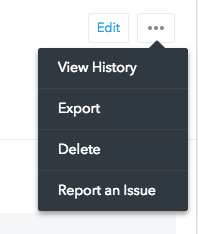 You can also select and delete contacts from the contacts list - press on Edit - then select the contacts you wish to delete, and press on the icon (Delete). In FullContact for Android, click on a contact, then click the trash icon in the upper-right hand corner. In FullContact for Web, open the contact you wish to edit, click Edit in the top right-hand corner to start editing the fields on the contact. In FullContact for Mac, open the contact you wish to edit, click Edit in the top right-hand corner to start editing the fields on the contact. In FullContact for iOS, open the contact you wish to edit, click on the pencil icon in the top right-hand corner to start editing the fields on the contact. In FullContact for Android, open the contact you wish to edit, click Edit in the top right-hand corner to start editing the fields on the contact. In FullContact for Gmail, click the pencil icon below the name of the contact. How do I add an existing contact to My Contacts? To add a contact in one of your address books in the Web app, click the [+person] icon in the upper-right-hand corner. What if I go over my limit of contacts? When you have exceeded your limit of contacts (on either the Basic or Premium plan), you will get a notification in your FullContact address book letting you know. A few features will also be disabled when going over your limit. When over your limit you will not be able to add additional contacts or sources. We will also stop syncing across all accounts and any read-only sources you have connected. To remove this, you can either delete specific contacts, disconnect sources, or remove social contact sources. If you are on the Basic version of FullContact, you can also upgrade your account to the Premium to manage over 1,000 contacts. 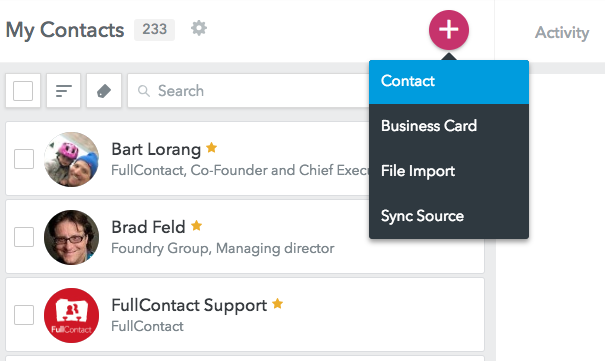 FullContact Premium version allows you to sync up to 25,000 contacts. You can find our pricing page here. Keep in mind that because of Google Contacts' storage limits, we cap the storage for all FullContact address books at 25,000. If I delete a contact on a social network, does that remove the relationship with the contact through the network? No. Social networks are considered 'read-only,' so we cannot delete contacts on that specific social network. If you are wanting to remove contacts from a social network, you would have to do this on the specific social network. For example, if you remove a contact from your Twitter address book, that will not unfollow that contact in your Twitter account.